Pilgrim House01263 715779work01603 870304fax Self-cateringPilgrim House is a fabulous Grade II listed property that is on the same complex as Pilgrim Holiday Cottages. Situated at Bacton, on the North Norfolk Coast, this property boasts 6 bedrooms all with en-suites as well as plenty of space for the whole family. There is an onsite pool, which you will have an hours exclusive use of each day and also the communal games room to keep you busy if you are not off exploring. • Outdoors: Garden, garden furniture, barbecue . Shared on site indoor heated pool - exclusive use for one hour per day. Please note the pool will not be available from 4th - 15th March 2019 due to maintenance. Pilgrim House is a fabulous Grade II listed property that is on the same complex as Pilgrim Holiday Cottages. 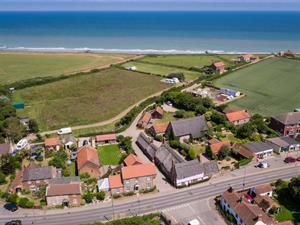 Situated at Bacton, on the North Norfolk Coast, this property boasts 6 bedrooms all with en-suites as well as plenty of space for the whole family. There is an onsite pool, which you will have an hours exclusive use of each day and also the communal games room to keep you busy if you are not off exploring.